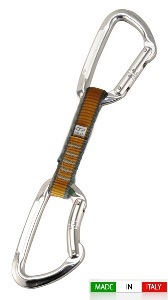 Classic quickdraw ideal for sport climb and mountaineering beginners. Equipped with classic shape, traditional gate carabiners. Equipped with robust 16 mm polyamide sling Extender NY (Ref. No. 7W10001204) with 12 cm in length.